Looking for something a little different? 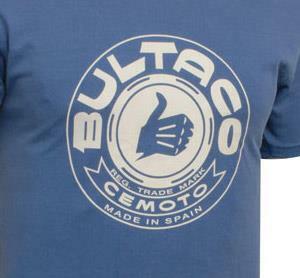 This retro-styled t-shirt celebrates iconic Spanish motorcycle manufacturer Bultaco. The founder of Bultaco, Paco Bultó, supposedly asked to be buried "with his Bultaco t-shirt and his moustache properly waxed". You may of heard of his grandson- MotoGP racer Sete Gibernau. 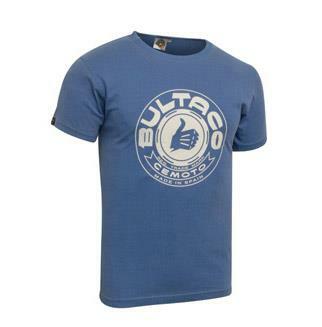 The t-shirt features a large print of the famous Bultaco logo. Apparently the 'thumb up' design came to be used after Paco saw a British racer giving the thumbs up to his pit crew to let them know that everything was good. The t-shirt is slim-fit, blue, 100% cotton and available for £24.46 (plus P&P).